The fastest mouse in Mexico. (Maybe the world) Are you a lady? Then you’re probably already on a first name basis with him. 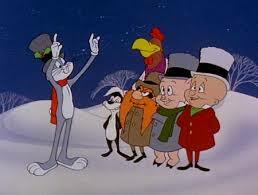 Directed by Friz Freleng, Chuck Jones, and Bob McKimson. #2. Bugs is eating Post Alpha-bits but runs out. He needs more because they are made of oats, and oats give you energy. So he blows up a balloon to hop the fence of Elmer, who shoots him down. (That’s Mel voicing Elmer. He hasn’t quite got the hang of it yet.) Bugs ends up landing in his kitchen and dazes Fudd. Sending him out the door saying he’s going home, Bugs enjoys his ill gotten gains. Elmer comes back to his senses and throws Bugs out. Bugs comes back and takes the cereal. He’s going to need all their energy to escape the gunfire. #4. Bugs (in disguise) hops on Elmer’s tandem bike with him. Seems Post Alpha-bits are now brown sugar frosted. (Which lets be honest, brown sugar tastes better than plain) Bugs takes them for himself. (Somehow splitting the bike in two) and digs in. Elmer brought his gun with him though, but it doesn’t matter as Bugs ate them all. But he makes up for it and brings Fudd more. Distracted by the generosity, Elmer bikes off a cliff. #5. Enough with the bits. Bugs shows off how strong he has gotten by eating Post Sugar Crisp. The whole wheat makes him invulnerable to the hammers Daffy tries to smash him with. #6. Seeing Sam coming his way with Post Sugar Crisp, Bugs disguises himself as a guy at a hunting lodge. Sam tells how he is hunting Bugs because he steals Post Sugar Crisp to make him strong. Bugs demonstrates, but is kind enough to invite Sam to join him. Since he can’t beat him, Sam does. #7. Sam is panning for gold. Watching from the bushes, Bugs comes out in prospector garb and tells him that Cactus Canyon has just had a gold rush. Sam leaves asking Bugs to watch his claim. Bugs was really only after his Tang. He gets it and escapes from the angry Sam. #9. Bugs as a bartender in a saloon faces a customer. It’s Sam who demands a drink. Bugs only has Tang which Sam begrudgingly takes. He likes it! Turns out he’s a wanted criminal though. (No! Really?) He makes Bugs dance, but the rabbit uses a rope to tie him up. Sam requests just one more glass of Tang. Bugs refuses. #10. Bugs is going into space as the first rabbit to land on Jupiter. Elmer launches him. It was all a ruse to keep Bugs from stealing his Tang. Removing one’s Tang supply is the best way to get even. Upon landing Bugs finds that not only is there air on Jupiter, (I mean, why else would he take it off?) but the planet gets its orange color from all the Tang there. At least he won’t bother you anymore, Elmer. #11. Bugs and Daffy squabble over a Post cereal 6-pack. Nothing more. My four shadows are gone! Do you get it yet? 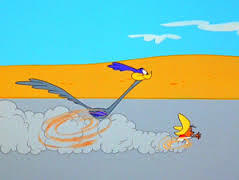 I said in a few posts back, that I wondered who would win in a race between Speedy and the Roadrunner. Foreshadowing! Seems it was too subtle. Well, we might as well carry on anyway. A bandit is coming to town. Named Pancho Vanilla? Oh, where did he go wrong? Winning washing machines for your mother just wasn’t cutting it anymore? You had to move on to burglary? Wait a minute… That’s Sam! Except for the fact he’s dressed up like an early version of the Frito Bandito and has a Mexican accent, It’s Sam. But for your sake, (and the fact that famed cartoon historian Jerry Beck said Sam’s last apperance was in an earlier short named “Dumb Patrol”,) he shall be referred to as Pancho for today. He robs the “Uno National Bank” and rides off. The town is all broke now. A mouse tells Speedy that this is good news. No money means they can’t afford cats right? Maybe, but Speedy points out that with no money the people will eat all the crumbs the mice typically live off. (Actually Speedy, I think they’d eat their cats. So yes, good news!… Until they run out of “gato guacamole” and move on to “mouse with mole…”) Speedy decides to go get the money back himself. (Since you’re not stealing this time, you’re actually being a real hero for once. Good for you!) He interrupts Panchos counting and claims to take it all back. Pancho has a good laugh at this and doesn’t notice Speedy take a coin away. He promises to come back for the rest, seeing as he can only carry one at a time. When he returns, Pancho is waiting and they march up to one another. Speedy is too fast and Pancho only ends up shooting his feet. (At least he’s going to heaven!… ‘Cause he’s got holy soles?…Forget I tried.) When burying mines, Speedy sneaks up from behind and shouts. The bandit flies up into the air and lands on the mine. (Land, Mine, Land mine! Almost had a gag there! Joke that is…) Pancho blocks the only way to his shack but leaves a little hole that his gun can poke through. Speedy runs through easily. (But he’s at least kind enough to give the bullet back.) A montage of Speedy succeeding constantly is played until Pancho sets up a trap to go off. As soon as Speedy comes in, he’ll be shot! But Speedy actually comes back to apologize. Seems like he took one coin too many and it actually does belong to Pancho who comes to get it. (ouch. But… didn’t he notice he was out?) Back at the bank, Speedy is counting the money to make sure it’s all accounted for. As he is in the thousands, Pancho sneaks up and shouts at him. Speedy loses his place and begrudgingly starts over. During one of their many chases, (in which Speedy is laughing a little TOO hard. Is it that fun?) Sylvester gets tired. (At least all that exercise is good for him.) He decides to try using technology to catch the mouse. (Why not? It’s the 60’s. Time to upgrade.) He sets up an electric eye that will sound an alarm as soon as Speedy exits his hole. Sylvester will then be launched towards him. (He crashes into the wall.) He builds a mouse disposal robot. Working the controls with a sonic viewer he spots the mouse and sends out his droid. Speedy is still much faster, so Sylvester turns up the robot’s speed as high as it will go. It crashes into the wall like he did. Round 2. Whatever that viewer is is connected to, Speedy is able to look through at the cat. The robot is sent after him but Speedy leads him into the viewers screen which somehow ends up hitting Sylvester as well. (Toon logic may be less logical than ours, but it’s more fun.) Third time’s the charm right? 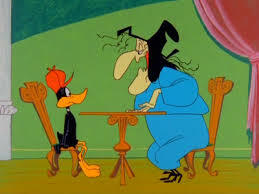 Sylvester warns the bot it is down to it’s last chance and unwinds its arm to place some dynamite in Speedy’s mousehole. Speedy keeps moving back, and Sylvester somehow knows to keep the arm going. Speedy leads the arm back behind the cat who can’t escape even by hiding in the robot. He tosses the thing out and grabs a club. (Ah the caveman approach. Very nice.) Speedy in turn, has gotten into technology himself, and sends a robot dog after the cat. This short has a most fitting title. Unlike a majority of shorts, this one does not get it’s name from some form of wordplay or song title, but rather it flat out tells what the short will be about. It begins at the H.Q. 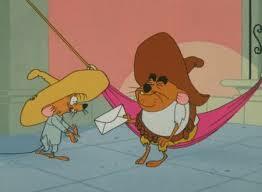 of a mouse named El Supremo. I don’t really know what that entails, but he’s fat so we can assume he’s a tyrant. He needs a message delivered to his friend, General Gracias. (Interesting name) He sends out a mouse named Manuel who is denied the privilege of finishing his will. He runs out and while the other mice think he will make it, we know full well that he is going to be food. The mice mark another one down. 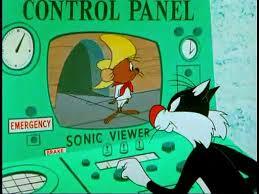 As El ponders how to get this message through, one of his mice suggests Speedy. Supremo agrees that it’s a good idea and is glad he thought of it. I can’t stand when characters do that. Better add him to my list of annoying people I want to hurt. (Fools who say Disney and Nintendo are for kids, A-holes who kill animals but don’t eat them, The cast of “The tenth kingdom”…) They send a message and Speedy arrives. El gives him his orders of how he must cross a desert, climb over mountains, cut through a jungle to get to Alcapulco. Speedy runs over the waiting Sylvester and leaves behind some flames and runs along the road making it bend much like the Roadrunner does. (I wonder which of those two would win a race. And on that note, why do I suddenly have four shadows?) Sylvester is smart enough to chase him in a car but Speedy stops for lunch break and Sylvester crashes. Next they’re in the jungle. (Either nothing interesting happened in the mountains, or Speedy ran around them) Sylvester takes aim from a boat in the river, but hits his head on a branch and shoots the boat instead. He ends up running from Caimans. (Hey, we’re in Mexico. There’s no way those are alligators.) He sets up a snare trap and catches a…I’ll be honest; I have no idea what that is. It looks kind of like Sam Sheepdog, the Tasmanian Devil, some green paint and some periods were all thrown in a blender. Maybe it’s just a radioactive jaguar. I can’t tell. Sylvester is eventually able to lasso Speedy, but the mouse drags him into a tree and ties him up. He delivers the message which turns out to be a simple birthday poem. What’s more, it looks like Supremo only needed someone to distract the cat so he could come over with cake. Speedy is rightfully annoyed and lets Sylvester go. The cat chases the two fat fish craps (you know, bass turds) into the distance. Speedy makes no effort to hide the fact that they will soon be eaten.